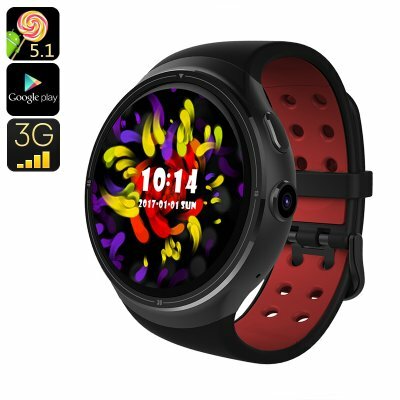 Successfully Added Z10 Android Smart Watch - Android 5.1, 3G SIM, Quad Core CPU, Google Play, OK Google, Bluetooth, 16GB Memeory (Black) to your Shopping Cart. The Z10 Android smart watch is a real stunner with fantastic looks and packed full of features. The circular 1.39 inch display can have a custom watch face so you can create or your own style or pick from one of custom setups to suite your tastes and the occasion. With Android on your wrist and a 3G SIM card slot this watch phone can do so much more than just make calls. The OK Google assistant will make it easier to send messages, place calls and manage your day to day activities. The Z10 Android smart watch will also be your personal fitness instructor. It has a heart rate monitor as well as pedometer and sedentary reminder so it can really help you monitor your health, improve fitness and keep track of your daily exercise. Having 16GB of onboard storage lets means you can load up on music to keep you motivated and with acces to the Google play store you can download entertainment apps as well. Powered by a quad core CPU and with 1GB of RAM this capable smart watch is well kitted out to deliver a fast and smooth performance. You'll be able to receive weather updates, play music and videos and do most of your other smartphone activates without being weight down. Perfect for a life on the go. Able to run in partnership with your Android or iOS smartphone the Z10 smart watch will alert you to any calls as well as notifications from SMS messages and social media alerts from Facebook, Twitter, and more. You can sync your phone book and even use the watch as a remote picture, making it easier to capture those stunning selfies with you smartphone. Packing a 350mAh battery the Z10 snartwatch will provide about 4 hours of continues talk time or up to 72 hours in standby so will over your a typical days usage with total ease. The Z10 Android watch phone comes with 12 months warranty, brought to you by the leader in electronic devices as well as wholesale Android smart watches and watch phones..
Z10 Smart Watch is a great watch for future generation, the important about it is you can everything with it! it's an excelent innovation that makes life easier and fun.